A Symphony of Lights is a light show put on every night by 44 buildings near the waterfront on both Kowloon and Hong Kong Island sides of the Victoria Harbour. These buildings light up and send coloured lights and lasers out into the sky to make a very colourful show with added music and narration. The show starts every night at 8:00 pm and goes for around 15-30 minutes each night. Admission is free. At special times during the year, such as Chinese New Year, the light show may be accompanied by a fireworks show at the same time. The only time the show does not go on is if there’s a Cyclone warning of 3 or higher or a black/red rainstorm warning made at 3:00 pm or later in the day. Once the warning is made, the show is cancelled for the night, even if the warning goes away before 8:00 pm that day. 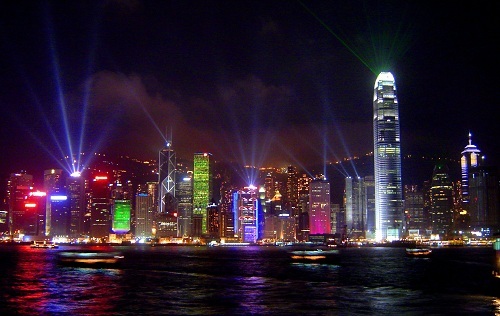 The best spot for viewing the light show is at the Tsim Sha Tsui Promenade. 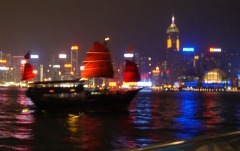 The Tsim Sha Tsui Promenade runs along the waterfront of the Victoria Harbour in Tsim Sha Tsui, Kowloon. From this spot you can see all of the brightly lit buildings that face the waterfront on Hong Kong Island. There are speakers nearby that have music and an announcer who narrates the show. These shows are narrated in English on Mondays, Wednesdays and Fridays, Mandarin Chinese on Tuesdays, Thursdays and Saturdays, and Cantonese on Sundays. Alternatively you can tune into specific radio stations nightly for narrations in English (103.4 FM), Mandarin (107.9 FM) or Cantonese (106.8 FM). If you don’t have a radio, you can call a phone number with your phone and listen to it through your mobile phone. The number for English narration is 35-665-665, and Mandarin narration is 35-665-668. If you’re looking for the best experience of A Symphony of Lights, take a cruise on the Aqua Luna, Hong Kong’s traditional Chinese Junk, and experience a 360 degree view of the light show from the ship. The Aqua Luna departs Tsim Sha Tsui pier at 7:30 pm and Central pier 7:45 pm so that passengers can enjoy the show when it starts at 8:00 pm. The closest MTR station to the Tsim Sha Tsui Promenade (the best viewing spot for A Symphony of lights) is the Tsim Sha Tsui MTR station. The East Tsim Sha Tsui MTR station is also very close. From here you can easily walk to the promenade in a couple minutes.